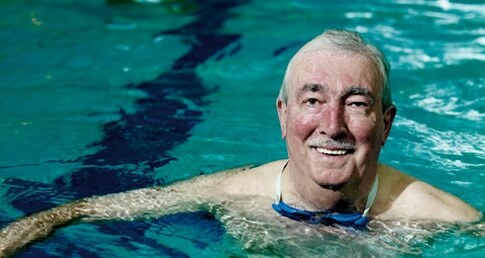 There is a significant amount of evidence which points to the fact that swimming can have a huge positive effect on the emotional wellbeing and quality of life of people living with dementia. Earlier this year we launched the Dementia Friendly Swimming Project, which utilises training and guidance to help local pools make themselves welcoming and accessible to people living with dementia. The benefits of swimming are widely spoken about, both in terms of health and wellbeing, and the highly accessible nature of the sport. Swimming has been shown to help with weight loss, lower the risk of cardiovascular disease and help with rehabilitation after injury and illness, but this is just the tip of the metaphorical iceberg. The Dementia Friendly Swimming Project is pioneering in its design and breaks down both real and perceived barriers to people living with dementia and their carers accessing swimming facilities. While the project is only currently in Manchester and Durham, it will soon be making its way to leisure facilities across the country. The ASA’s Head of Health and Wellbeing, Lara Lill, spoke to Politics Home about the impact of swimming on dementia: “The nature of the project is to build a network of dementia friendly pools. “Firstly, we are looking at the environment of the pool and seeing what changes can be made to create a warm, friendly and safe environment. Find out more information and read the full interview on the Politics Home website.